We've looked at a few cloud-based video surveillence products. They've been more similar than different in that they all have great features. Yet they all seem to be lacking some key ingredients to really complete the package and make them amazing. That said, today we're going to be looking at Icontrol Networks' Piper nv. Piper nv is a second generation product, with the addition of night vision its biggest change over the original Piper Classic. However the nv also sports higher resolution video and an upgraded Z-Wave controller. Inside the box you get the Piper nv, wall-wart USB power supply, three AA batteries and a quick setup guide. 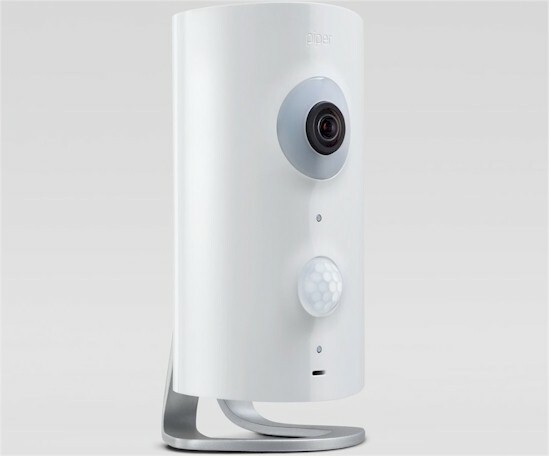 The Piper nv contains a speaker, Z-Wave controller for up to 232 devices, microphone and temperature and humidity sensors in addition to its camera. Unlike the Canary I reviewed last month, you can trigger on temperature events. Like the Canary, you can only look at data from the humidity sensor. I collected all of the information I could about the nv from the nv's meager tech specs into Table 1 and included Canary's specs for comparison. - Can be triggered by Z-Wave sensors. It wasn't obvious how to take the nv apart. So not wanting to break it, I relied on the FCC ID pictures to get a look inside. The pictures aren't clear enough for exact component identification, but you can see that the IR LEDs are on a separate board from the lens. This would let Icontrol Networks introduce a higher resolution version of the Piper Classic without night vision. The slightly clearer view of the main board below reveals a TI SoC that probably does most of the heavy lifting. You can also see the Sigma Designs Z-Wave radio module at lower left and Micron RAM to the right of the TI processor. The large device on the other side of the main board shown above is flash memory. Setting up the Piper nv was relatively easy, with a couple of device-specific hitches. Like most other Smart Home devices, you control the nv via an app, either Android 2.3.3 or later or iOS 7 or later. I chose to set up using my Samsung S4 running Android 5.0.1, which entailed first getting the Piper Mobile app from the Google Play Store. The app guided me to set up a new account, then asked if I wanted to set up a Piper. That's when things got a bit difficult. Piper broadcasts its own wireless network (Piper) that you connect your mobile device to. Then during the setup process you enter your wireless network SSID and password so Piper can be joined to it. The snag I ran into was that my phone kept switching back to my main network before setup was complete. When I tried to switch back to the Piper network, I couldn't, so had to start over. I went through this about half a dozen times before it finally worked. Later, I found a support article on Icontrol's support site that recommended shutting off the phone's "Auto Network Switch" so this doesn't happen. But by then, I was already set up. In hindsight, I could have just temporarily deleted my home network's Wi-Fi credentials from the phone until the Piper part of the setup was done, then restored them. All communication between the app and Piper cloud services happens over an HTTPS connection. Icontrol says video and audio are encrypted with "high-grade SSL encryption".